What Should an Arabic Bestseller List Look Like? It could look like this. But it wouldn't have to. Booksellers, authors, and publishers in Syria, Lebanon, Egypt, and Jordan expressed interest yesterday in the idea of a “universal” Arabic bestseller list. The idea came out of a Abu Dhabi publishers’ training workshop that Salwa Shakhashir (Dar al-Salwa) blogged about for Publishing Perspectives. What should a bestseller list look like? One well-known model is the New York Times version, as publishers discussed at the Abu Dhabi workshop. 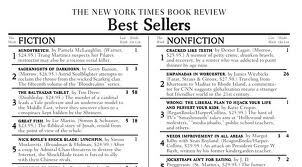 The NYT started their bestseller list in April 1942. I don’t think anyone is ready to start surveying every book stall and stationery shop in the Arabic-reading world for how many copies of Essam Youssef’s “1/4 جرام” they’ve moved. At least, well, I’m not. Rehab Bassam of Dar el Shorouk notes that the list’s methodology depends on its aim. She said that, if the aim is to show trends, one way to start would be to ask each major publisher for a list of their bestsellers for region-wide promotion. Another option would be to compile a country-wide “most popular” books list. Perhaps a universal, region-wide “top 10” makes less sense than a “top 10” from participating countries: a top 10 from Egypt, from Syria, from Jordan, from Morocco, from Lebanon, from the UAE, and so on. The downside of this is that it would mean lots of work and would require unprecedented openness from booksellers. However, this way, booksellers in Algeria could see—at a glance—what titles are moving in Syria, and perhaps pick up a few of them. Ideally, it would be organized by a major, credible, transparent, region-wide news or cultural organization without ties to the book-publishing business. The list would primarily be available in Arabic, but no reason not to translate it for non-Arab publishers looking for hot titles. Or it could look like something else altogether. I would love to hear your ideas: positive, negative, constructive, or otherwise. Previous A Revolution in the Arabic Publishing Industry? Next In Libya, Is Poetry Contagious? Marcia, idea is good but not easy and there is a trust issue here… still there must be a FIRST time. If there was a booksellers association in the Arab world then they could compile the list of best sellers from each region and then put the results together to get an Arabic bestseller list. Unfortunately we haven’t got a booksellers association in the UAE, not sure if other Arab countries have them. Thanks Bodour… someone suggested an entity like Neilsen. I’m still thinking and asking around. Of course credibility and neutrality are important. Do you know if the idea is still simmering, or if it’s been dismissed?